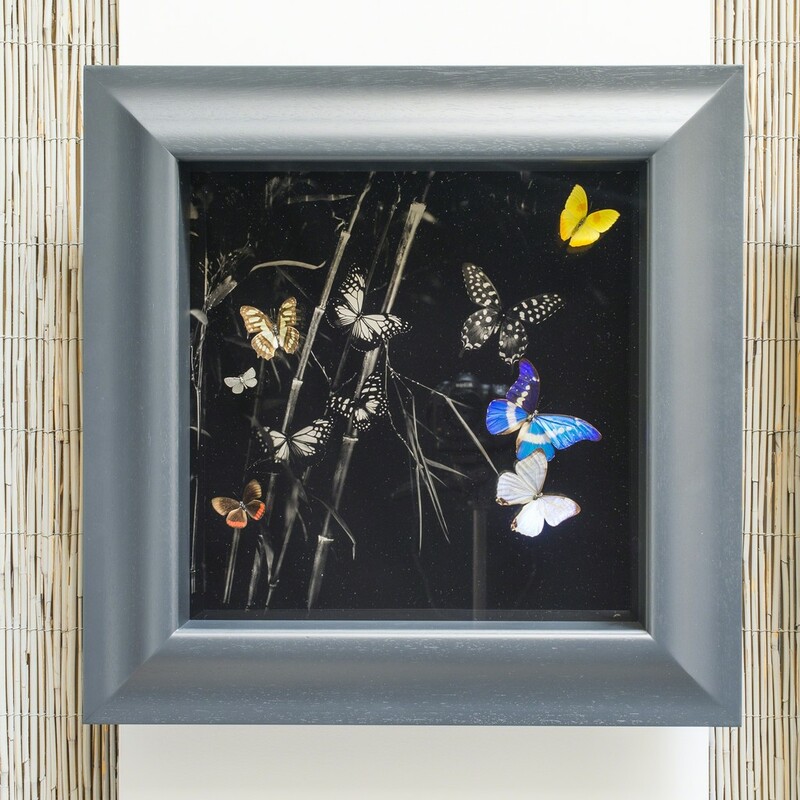 Nick Jeffrey collaborated with artist Nick Reader to produce a rare series of new works combining two vintage mediums; entomology and Collodion wet plate. Nick Jeffrey has been working with natural art forms since 2003, seeking out ways to bring the fragile beauty of nature to his audiences. His passion for nature and his desire to help protect it leads him to seek out natural and hand made processes; the human element in creative processes. 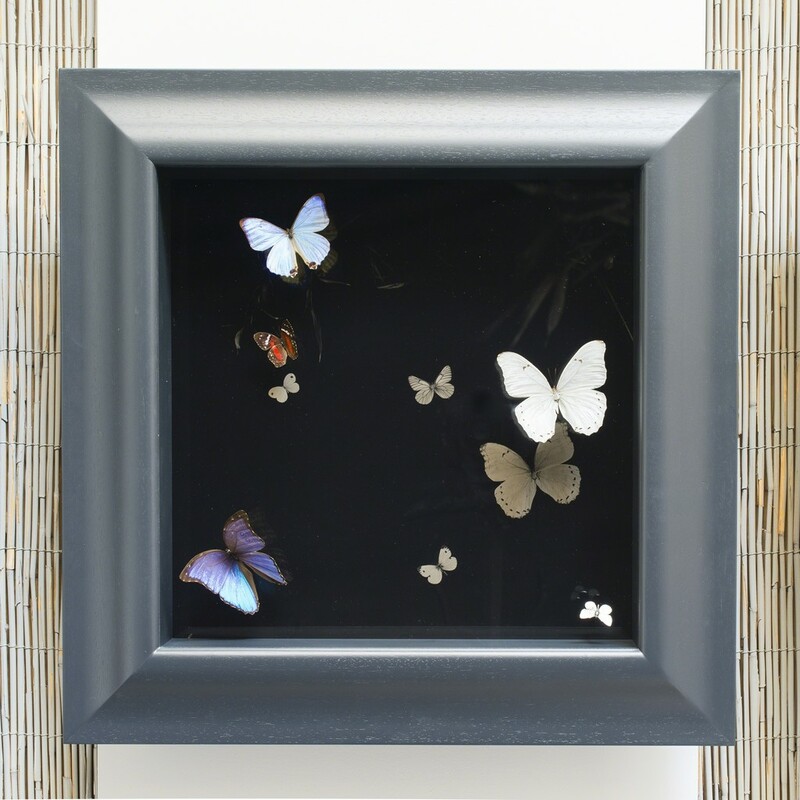 He has collaborated with craftsmen of various disciplines; cabinetry, sculpture, photography, gilding, casting and hand-painted gesso and clay board preparation to name a few. 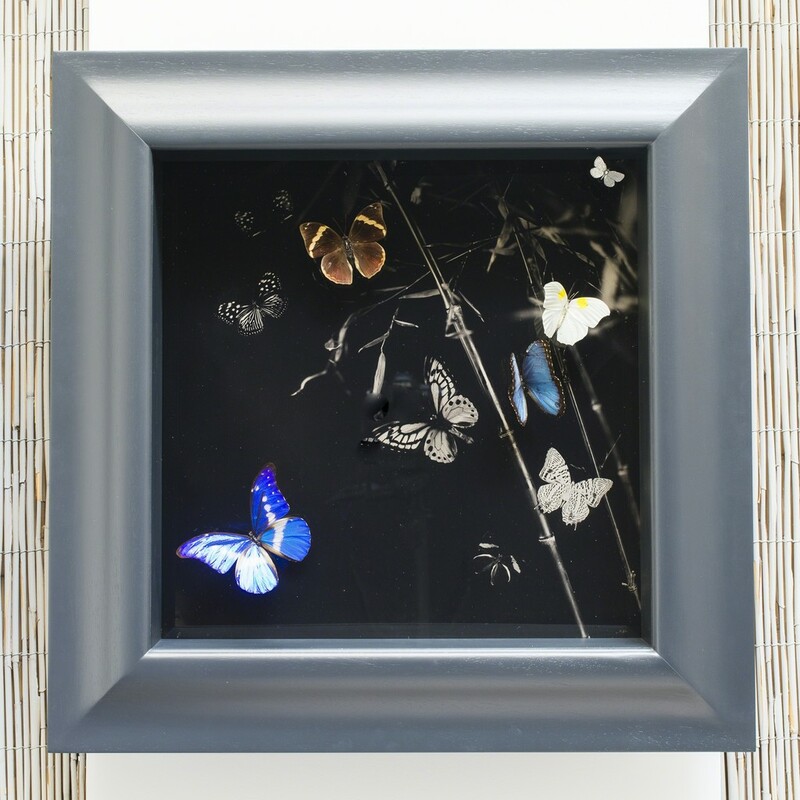 These learned handcrafted media combine beautifully with the traditional practice of entomology – delicate life-like preparation of the insects mounted in the artworks – and this new wet plate process has once again produced a series of intriguing works. Nick has worked with the sustainable butter y trade for several years. He helps educate local communities about their environment and helps to generate alternative incomes for these local people through the ethi- cal trade of farmed pupae and dried specimens. This alternative and sustainable farming practice replac- es hugely damaging “slash and burn rainforest practices” to make way for arable farming and livestock pasture, and in some instances even greater evils of drug production. Butter y farming is a sustainable alternative for these communities that gives us all great hope of a future with healthy rainforests, not just with diverse wild butter y populations, but a healthy bio-diversity. But- ter y farming does not damage rainforests, nor does it endanger ora or fauna species, but instead helps to protect a precious local bio-diversity and provide incomes to an aspirant local community. This new series of works employs a photographic process primarily used between 1850 and 1880. The processes have a quality and beauty that even today cannot be matched by modern technology and that can only be properly practiced by hand and worked by eye, feel and timing. The physical act of making these photographs is part of what should make one appreciate the result. It is impossible to completely control the entire process, as trial and error, and even the smallest variation in studio and dark room conditions is likely to produce an unexpected outcome. Even if the result is differ- ent, sometimes it is pleasantly surprising. The so called beauty in imperfection, the mysterious power of creative human endeavour revealing something deeper, more magical hiding below the surface. So much is dependent on the chemistry, the temperature, … the one hundred and fty year old recipes used in this wet plate process. However, with good technique and much trial and error it is possible to in uence the result, but always working within certain limitations. The practice of Collodion wet plate is being pushed into a brand new area in this exciting series of new works, where photographer Nick Reader and artist Nick Jeffrey combine their vintage practices to create an illusion of the beautiful natural world. A world not ‘snapped’, but intricately woven together out of the alchemy of muted silver hues and a multi-faceted world of natural form and colour, of real scienti c and entomological curiosity.